I pulled out my fire boxes the other day. “Fire boxes” being the tote boxes filled with person mementos to save from a fire. As I pulled out the photos, newspaper clipping and Christmas ornaments, I spied something curious in the bottom. A wooden plaque with a small, tinkling bell and a miniature wooden canal boat. Why do these things matter to me? Because they represent a tradition of my National Park Service career. When you leave a park, whether to take another job or retire, you are presented with a plaque or item to take with you. Something that reminds you of your time spent at that national park. Upon leaving Independence National Historical Park, I received a “skeleton” key that unlocks the front door of Indpendence Hall, as well the plaque. When I moved to Colorado eleven years ago, I received a miniature hand-carved wooden canal boat from the staff at C&O Canal National Historical Park. For most people, a career in the national parks will lead to many of these mementos. Because most people will take jobs at various parks. Which leads me to Ranger Rita. 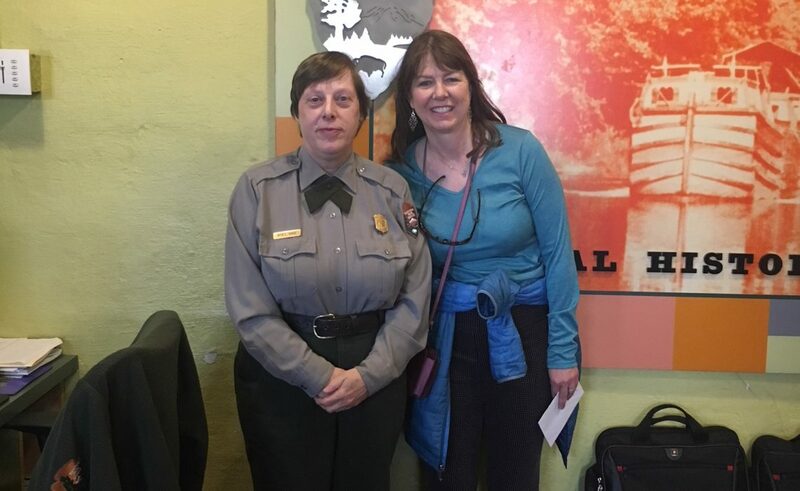 I went back this weekend to Cumberland, Maryland to celebrate the Park Service career of Ranger Rita. Rita will only have one memento to celebrate her 34 years in the National Park Service. Because Rita is the unique person who dedicated her whole life to serving the visitors to the C&O Canal National Historical Park. I met Rita when I first arrived in 2005. I served as the Williamsport sub-district ranger, and Rita held the same position in Cumberland. We were separated by 65 miles, but that didn’t stop us from being close colleagues. Knowing nothing about canal history, she took me under her wing and shared her wealth of knowledge. She provided a sounding board for new ideas, and helped me reason out solutions to vexing problems. For much of my time at C&O, it was Rita and me. For around six months, we had no supervisor at all, and Rita was the de facto “acting” supervisor. Thank goodness for her wisdom and candor, during what could have been a chaotic time. During my 17 years in the NPS, I’d met rangers at other national parks who’d been there awhile. Most of them seemed tired and had lost their enthusiasm for the job. But not Rita. Even after 30 years, she approached each day with passion and creativity. Also striving to improve operations, create better programs, she would come to work with a smile on her face, and a positive attitude. Even now, as the days wind down single digits, she’s working to wrap up every loose end and pass on her good work to her successor. Tonight, I attended Rita’s farewell bash. People came from far and wide to pay tribute to the legacy she is leaving at this park. Co-worker after co-worker commended her kindness, knowledge, and memories passed on to all that worked with her. I’m so glad I got to celebrate this extraordinary woman who served her park and community with such dedication. Here’s to you Ranger Rita — you are a true inspiration!